Snapping pics has become even more exciting now that digital has entered the realm. Professional photography is a demanding career, but a casual gig in stock photography, however, can be rewarding and done at your own pace. Look into sites like iStockphoto and others to hawk your digital wares. Payment ranges from a few pennies to 20 cents per photo. If your thumb is even slightly green, and you tend to do well with your garden year after year, you may be able to generate a little cash with your abundance of veggies, fruits, and flowers. While hobby gardening won’t make you much more than the price to keep a garden, selling your extras to friends, family, or in a legal roadside set up could help you with this year’s canning costs. Note that local law may require licensing to sell edibles or plants that may carry biological threats. Research carefully before making any sale. “Pay me to shop?” It sounds like a dream, doesn’t it? But if you keep your expectations low and only shop those places you’d buy from anyway, mystery shopping can pay for your gas the next time you head to the mall. With an hourly wage of $6–$14 (plus reimbursement of out-of-pocket expenses), it pays to have the occasional lunch out. While only a small percentage of bloggers bring in the big bucks, even the most humble blog can earn between $5–$100 a month through basic ad and affiliate sales. It takes a little time to establish yourself, so be patient. If you’ve been blogging for a while, however, look into ways that writing about your passions can translate into commissions with our guide to how bloggers make money. I don’t like to do it, but if you are one of those who gets great joy from decluttering, creating spreadsheets, or hoarding plastic bins, you’ll likely do great with part-time work as a virtual assistant or organizer. In today’s consumer-driver world, people just have too much stuff and information (and not enough time or space). Spend a few hours each week offering your “help,” and you could easily score $10–$25 an hour for your skills. While hobbyists can’t usually charge as much as professional musicians, plenty of budget-minded brides and grooms will pay between $100–$200 for the joy of music. I personally got through some tough money spots in college by playing the piano at weddings and by being a sub for the local church pianist. Keep a list of references for gigs you’ve done to supply future inquiries. Your unique handicrafts can earn money on a site like Etsy, but most crafters earn cash with their more practical skills. Since no one in my family really likes to sew, for example, we happily pay for curtains to be assembled, blouses to be mended, or sheets to be shortened. If you can deal with last-minute requests and are quick with a needle, you can expect to get $14–$50 for each simple sewing project done from the comfort of your home! Local laws vary, so be certain of any health regulations before you open shop. Many will require a separate kitchen or license before you advertise or even sell that first cake. For small bakers in some jurisdictions, however, it’s acceptable to bake or decorate a cake to sell to family or friends without expensive legalities. If you can whip up a delicious cupcake or make a mean crumble, you could earn $15–$75 for an afternoon of baking! While there aren’t really many legitimate jobs out there for playing your favorite online or console games, there is a demand for people to do the menial errands surrounding some RPGs, MMOGs, and MOGs, especially while they are at work or on vacation. If you spend a good chunk of your time playing highly competitive games online, it’s possible charge a fee per batch of tasks (usually a few cents per action) or even sell your well-established accounts for a profit. To find out what sells, become active on forums and online message boards where other gamers chat. The pay of task work will be very low compared to steady online work (and the market will be diluted by those in foreign countries who can charge much lower rates.) Also note that many games officially prohibit some paid activities. Do this at your own discretion. Wives have been dragging husbands to dance studios for years, often with embarrassing or expensive results. If you have some formal dance training, are patient with others, and do a mean foxtrot, you could earn some cash giving lessons in your spare time. As with any service offerings, be sure you know who your customer is before you have them over or meet them at a studio. Expect to earn $25–$85 per lesson, charging more for couple’s sessions. What hobby of yours would you like to see turned into a part-time income? I'm really into soccer. I play, I watch, and I'm certified to ref youth games. There is a pretty significant initial investment ($50-$100 to be certified, $50-$100 to join an association, $500 to buy all the required uniforms and equipment), but the average game pays $20 an hour, and it's not uncommon to get 5 to 10 1-hour games per weekend, and a few games during the week. Love that idea! Being athletic is definitely at gift that can turn into some extra cash down the road. Thanks for sharing! I'm surprised webdesign didn't make the list! I started it out just for fun as a hobby and was able to turn it into a money-making gig on the side! 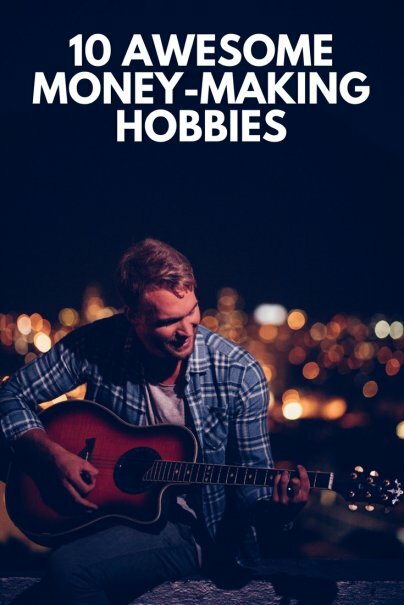 Oh man, these hobbies sound like a lot of work. Anyway, I'm working on my photography skill. Some classes would really help, but for now I'm just taking a lot of pictures. oh wow,these sound like alot of work.,...but its a hobbies its something that we like to do...i like football the young youth league...i like to spend time with the kids...and i also like to work on my photography skills..so,everytime we have football games thats my time to take alot of pictures..!! What about tutoring? I know that's what I'm planning on doing this summer, and since I have my teaching cert, I can probably ask for $40 an hour at least. Great ideas. I cant dance, bake, or sew. Left with photography, doing property inspections maybe. More than 20 years ago, a friend gave me an aquarium, and that's how I started getting obsessed with aquarium fish. I was able to breed different types of tropical fish that I decided to convert our old swimming pool into a fish pond. i think any hobby can make money. if you spend any money on your hobby, someone is making money off you. what better side business to enter than something you know a lot about. i've always started a company or side venture with whatever my hobby was. it was fun that the hobby would pay for itself. so my advice is, stick to your hobby and what you enjoy and then find a way to insert yourself in the value chain. thats how i became a 1%er. And I think this sounds like a very valuable piece of advice. Sincere Congratulations Mr./Ms. Onepercent-er and thanks -really - for sharing the insight. I like gardening best. Alot of people here in my local city tend to do this with farmer markets. Since gas prices are going up (hence food prices), people are always looking for some sort of bargain. I like this gardening idea alot. What about trading? That can be don't for hobby and moved into really money, quite fast if you good and do a lot of research!